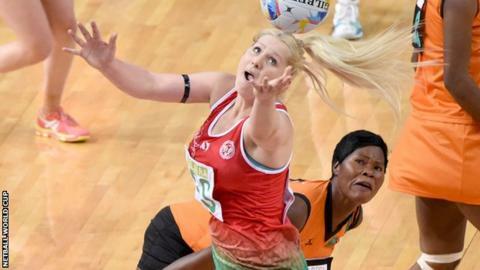 Wales goal-shooter Chelsea Lewis will move from Celtic Dragons to Netball Superleague rivals Team Bath. The 21-year-old led Wales' attack at the recent World Cup in Australia, notching up her 50th cap as Wales secured seventh place. Lewis has now gone to New Zealand for a second spell there to gain experience before the new British season. "I am looking forward to working alongside some strong and experienced players," Lewis said. "Knowing that I will be returning to the UK to play for Team Bath - who are not only a formidable force but have an exceptional winning legacy - is exciting. "After having experienced a great World Cup and played some hard-fought matches against different countries, I feel I have learnt so much and am better for it. "Now I get to play alongside some current ANZ Mystics and Silver Fern players in Auckland for Netball Waitakere. "Having the opportunity to play in the National Provincial Competition is an added bonus for me, both personally and professionally." Lewis has so far spent her Superleague career with Welsh side Celtic Dragons and scored 420 goals from 534 attempts last season, putting her fourth in the individual shooting ranking.